Who would’ve thought there were so many games that started with ‘A’, eh? Monster Munch? Check. Pepsi? Check. B*Witched on MP3? Cranked up to eleven. Let’s blame it on the weatherman… er, rock. Ahem. I could still pull this one back, I’m sure. Do I want to take off? I don’t know – I can’t even see the runway over all the dials. I could be facing the terminal for all I know. I’m no aeronautics expert, but I’m pretty sure that the windows in front of the pilot aren’t for show. What a fantastic idea this is. Keep the runway clear for landing aircraft by chopping down trees, whacking moles and shooting birds. Even though it’s in Basic, what could possibly go wrong? Well I’ll tell you – the keys don’t work. Tch. Shoot down planes to protect the fleet. Great, eh? Only when you do shoot down the planes, you have to shoot them again before they crash into the fleet. Also, you’re in a boat, so you don’t move anywhere near as fast as they do, so shooting down a falling plane is completely impossible. 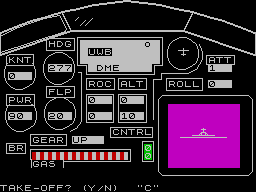 Still, it has some quite nice UDGs, like the parachuting pilots, and I can see everything, and the keys work, so it’s the best game I’ve seen today. Tch. You know what I wish? I wish that everybody who thought it’d be cool to make this sound when their games loaded just, y’know, hadn’t. Anyway, the instructions are in German, but I’ve picked up ‘links’ and ‘rechts’ somewhere along this guide so I’ll give it a shot. And instantly regret it, because it has Lunar Lander-esque controls, in a Basic environment where you can only press one key at a time. And then it gives you tiny corridors to fly through. Nngh. This has got to be the slowest, most pointless thing I’ve ever loaded. There’s a dot, with a flight number and heading on it, and it’s moving across the screen at glacial speed. And after a minute or so of Spin running at maximum speed, another labelled dot appears headed the opposite direction. So I left them, hoping they’d crash and maybe I’d get a cool bit of animation, or at least see a game over screen, and… nothing. They fly past each other and continue with their journeys. This isn’t even a game. I can’t even see any way to interact with it. Why can’t I pull a Die Hard 2 and crash all the planes into the ground? Even the upbeat poppery of B*Witched can’t distract me from the pointlessness of this thing. Gah. There are times I wonder about the family-friendly policy we have here at YS3. There’s been the odd occasion where a slightly risque word has been both appropriate and funny, but I have resisted the temptation. Never has the temptation been as strong as it is now. But I’ll take a deep breath, and calmly elaborate on what is wrong with this game. There is no theme tune. There is no music at all. The helicopter looks barely like a helicopter, let alone Airwolf. The keys are all far, far too close together. The very first obstacle you run into is a wall that you have to shoot a way through that regrows itself before you can fly through any gap you make. I hope that the last few months of reviews have given you some idea of the crapness that I am familiar with. And I want you to keep my level of experience in mind when I say that this is the worst thing I have ever, ever played in my life. I would rather spend an hour with Air Traffic Control than another minute with Airwolf. Alright, so that’s an entire batch of games with only one point between the lot of ’em. I’m just going to keep going here, I mean – it can’t possibly get any worse, can it? 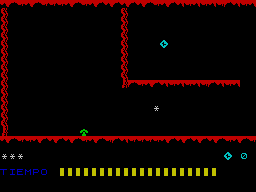 It’s a Spanish text adventure, and thus is exempt from any abuse at all. It has a fairly polished feel to it though, so odds are it’s pretty good. It’s a text-heavy Slovak game, and thus also earns exemption. Ohoho, Akerico. You might be Spanish, but you’re also a jerky flip-screen arcade game in which the player ‘controls’ an asterisk that moves at seemingly random speeds, crashing into walls and dying at the merest hint of a touch of a button. In fact, you know what Akerico? You’re a little bit crap, aren’t you? But at least you’re not offensively crap, so I suppose you can have a point or two. Slagging you off has cheered me up. This one’s kind of interesting. 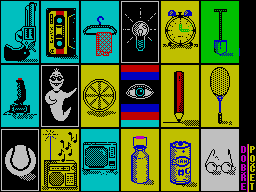 It’s a puzzle game where you get a minute or so to try to memorise all these pictures, then have to pick which one was where. The only trouble is that’s all in Czech, so unless you happen to know the Czech for all the things there are pictures of, you’re not going to get very far. It’s a platform adventure in which you have to collect a bunch of diamonds. (I think.) So it’s a little bit Jet Set Willy, only if you die on a screen then all the diamonds you collected there before then reappear. Grrr. I… I have no idea what this is. 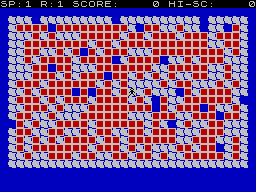 There’s all these squares, and all these blobs, and then they all disappear, and then I die. The keys don’t do anything. There’s only one way to score it – Air Traffic Controller out of Airwolf. Well, I hope you all appreciated that bumper size installment of the Guide – I know I appreciated it, if only for a glimpse as to just how much worse games can get. Next time it’s Alcatraz to Alien! 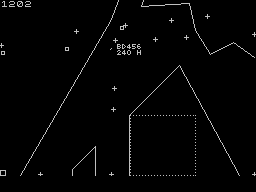 I see what you mean about early 80s games being akin to CGC entries. I thought Airport 82 was some sort of ALS clone before I noticed the date. 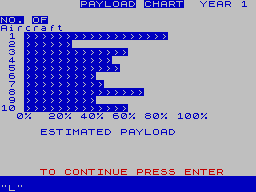 Airwolf is such a… bad game. I mean, what kind of person makes the first obstacle in their game nigh-impossible to get past? I’d cheat to get a little further, but who knows what kind of madness would be on the third screen? No no, it just doesn’t bear thinking about. And I was so disappointed that Airport 82 didn’t work properly. The instructions made it sound fantastic (and I’m pretty jaded to games with four pages of instructions now). 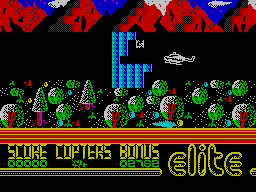 A L I E N is a great game (in my humble opinion) so that’s something to look forward to as you bravely hack your way through the speccy wasteland of forgotten and crappy games. 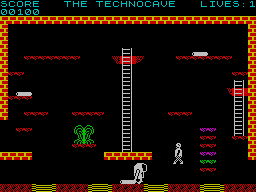 I remember just after getting my first Speccy (14th birthday present back in ’83) mum bought a pack of games from one of the horrendously overpriced mail order catalogues. One of the games was Airliner, which she thought dad would enjoy. 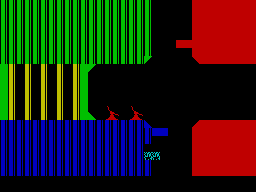 We must have ‘played’ the game all night, once managing to get one of the dials to change – we were flying! For all of 10 seconds before we crashed for no apparent reason.